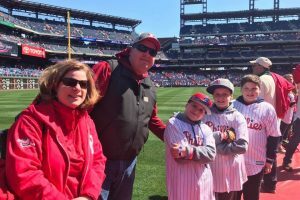 Bryce Harper, Aaron Nola and the rest of the 2019 Phillies might have more name-recognition, but a fourth grader from Saint Rose of Lima School, Haddon Heights, full of that Philly grit and perseverance its sports stars are beloved for, stole the show at the Phillies’ home opener last week at Citizens Bank Park. 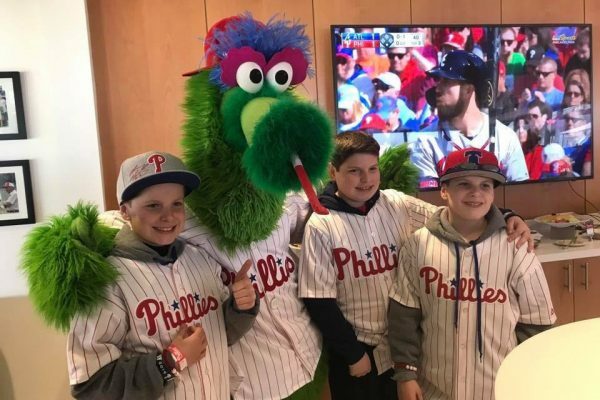 Daniel Scharff, an 11-year-old Audubon resident and devoted Philly sports fan, threw out a ceremonial first pitch to the Phillie Phanatic in front of a sell-out crowd. 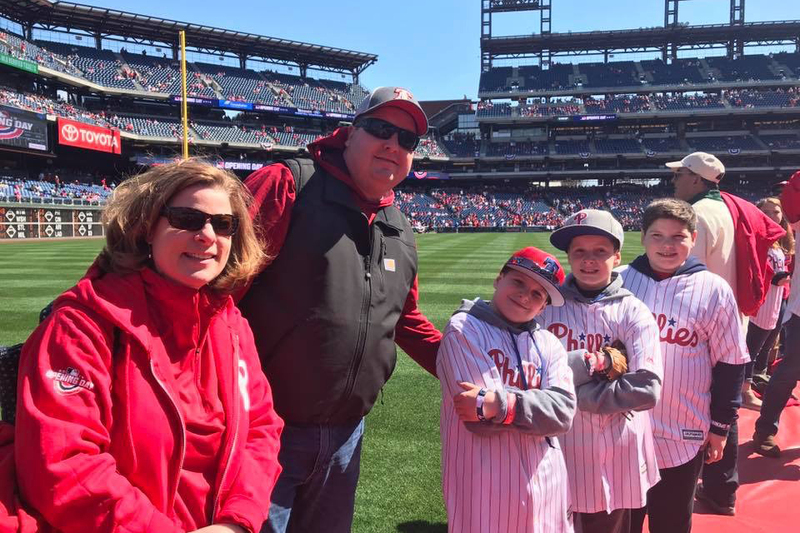 Daniel Scharff, 11, is pictured on the field at Citizens Bank Park during the Phillies’ home opener, where he threw out the first pitch, with mother Kate, father David, and brothers Brian and Patrick. Born with a mild case of cerebral palsy, Daniel had surgery last January to lengthen and rotate his legs. Since then, he has been rehabbing tirelessly at Cherry Hill’s Nemours DuPont Pediatrics, and his leg casts became walking boots, and, now, braces. Despite challenges with his gait, and walking on his toes, Daniel has never let the disorder stop him from an active lifestyle, his father, David, says. When Nemours, one of the Phillies’ sponsors, picked Daniel to throw out the first pitch, he was “extremely happy,” David says. For the past few weeks, father and son have spent many nights outside, weather permitting, with gloves and ball, getting ready for March 28. A visit from Nola while he was in rehab, teaching him the proper grips for the perfect fastball or curveball, also helped prepare Daniel. Along with his father, Daniel’s big day included his mother, Kate, a PreK-3 teacher at Saint Rose of Lima’s Rosebud Academy; twin brother Brian; older brother Patrick; and aunts, uncles and cousins. “Daniel kept the ball; he was thrilled,” David says. Now, many more are root, root, rooting for Daniel Scharff.